We have a serious issue before us over which Christians are divided in their response. I received a question from a member of the church asking me how we should respond to the Syrian Refugees. In his email he said, “On issue after issue the Church seems less compassionate than any other group. The world is topsy-turvy.” Others feel the opposite, that Christians should call our government to close the borders. 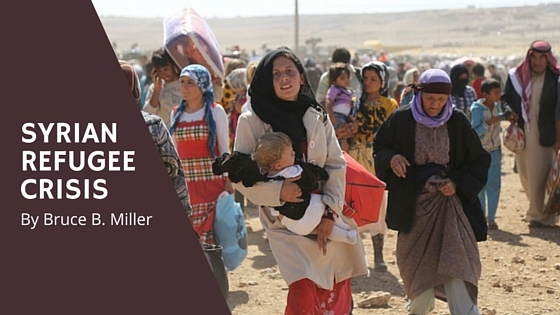 How does the Bible guide us to respond to the growing crises of refugees fleeing from Syria and other war-torn regions? Let’s acknowledge right away that these are complex issues, so we should avoid simplistic sound-bites and extremes such as compassion calls us to welcome everyone in, or that security calls us to lock our borders and let no one in. We must also ask about the differing roles of the church and of the government. As Christians, we are about to enter a time when we celebrate our Savior who was a refugee to Egypt fleeing violence in his home country. The Bible clearly calls us to compassion, especially for the stranger, the alien, and the refugee; and yet the Bible also calls on the government to protect citizens from wrongdoers. How do we bring together a desire to show compassion with the responsibility to keep our country safe? One the one hand we can ask what our country’s policy should be. Do we agree with the plan by the Federal government or support the governor of Texas’ opposition? These are complex political policy questions. We cannot draw a straight line from a biblical principle to a specific policy. My hope is that we will give each other space to disagree on these issues without questioning each other’s faith or sanity. In the body of Christ, we need to learn how to disagree respectfully. Let’s focus on Jesus and give each other gracious space to hold different positions, as we pray to grow in understanding Christ’s wisdom. On the other hand, we must ask how we respond on a personal level. How do you relate to people of different ethnicities who live in our community or with whom you do business? How will you respond to the refugee who comes to our community? We need to consider deeper questions about what God is doing. What if, through the senseless evil of war, God was bringing unreached people to our community? What if, through great tragedy, God was bringing about the triumph of the gospel? We need to wisely redeem opportunities to share the love of Christ. The enemy of our soul works to create fear, hatred and confusion. Christ offers peace, healing and assurance. Far from being naive, we need to recognize that this battle is taking place both on earth and in the spiritual realm. Rather than reacting in fear when you walk into Einstein’s Bagels and see a group of men in traditional Middle Eastern dress or women in Burkas, why not respond in love. Pray for them. Welcome them. Reach out to them with the love and gospel of Jesus. Let’s be full of bold compassion to advance the gospel of Jesus. Let’s pray that in this terrible displacement of millions, the Holy Spirit blows winds of revival. Let’s pray for Christ’s kingdom to advance, for the light to shine bright in the darkness. Let’s pray that many Muslims will come to Christ. And may this start with your personal conversations with people of a different ethnicity than yours. Terrorists and violent men may have meant this war for evil, but God can use it for good. God is building his church and hellishness of ISIS will not prevail against it. May the Lord fill us with his love for friends and enemies.